If you think of turtles the way you think of amphibians (because turtles can remain a relatively long time underwater), you'd be mistaken to include them into that category. Remember that turtles are reptiles—terrestrial vertebrates that have scaly skin and the ability to lay eggs with hard shells. They aren't tied to the water like amphibians and they can live on land for an extended period of time due to their expanded lung system. The exception, of course, are sea turtles which are rarely seen on land, but even sea turtles must surface in order to breathe air and their special lungs aren't affected by water pressure when they dive. They pump oxygen stored in their muscles and blood into their lungs when they move their flippers. Sea turtles like Green Turtles can stay submerged for five hours; Leatherbacks for over an hour and Hawksbills for 45 minutes. Fossil records inform us Painted Turtles have been around for millions of years, evolving through the ice age. It is a widespread turtle that lives in the slow moving fresh waters in parts of Canada and Mexico and the United States. In winter, the turtles hibernate, and in the North this inactive period can be from October to March, but far down South these turtles may not hibernate at all! However, if temperatures rise, even in a month such as February, turtles will become active until the cold again sets in! Like I mentioned earlier, hibernating, for the Painted Turtle, is achieved by burying itself on the bottom of a body of water. Other hibernating areas may be near the water on a shore bank, or in woods or pastures. Hibernating underwater the turtle prefers a shallow depth, digging about 2 meters (7 feet) into the mud. The turtle does not breathe in this state but it receives oxygen through its skin if its surrounding allows. The turtle's blood, brain, heart and even its shell adapts to the extreme lactic acid build up while oxygen deprived. 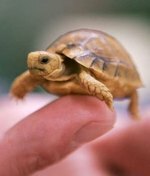 Turtles are cold blooded,and their metabolic rates are very low when compared to warm-blooded animals. These metabolic rates fluctuate with the varying temperatures. In cool temperatures the turtles are slow. In warm temperatures their metabolism speeds up. The faster their metabolism, as in warm temperatures, the more oxygen they need, so their underwater time is limited to only a few minutes. During the night as their metabolisms slows, their underwater time could last for hours at a time.